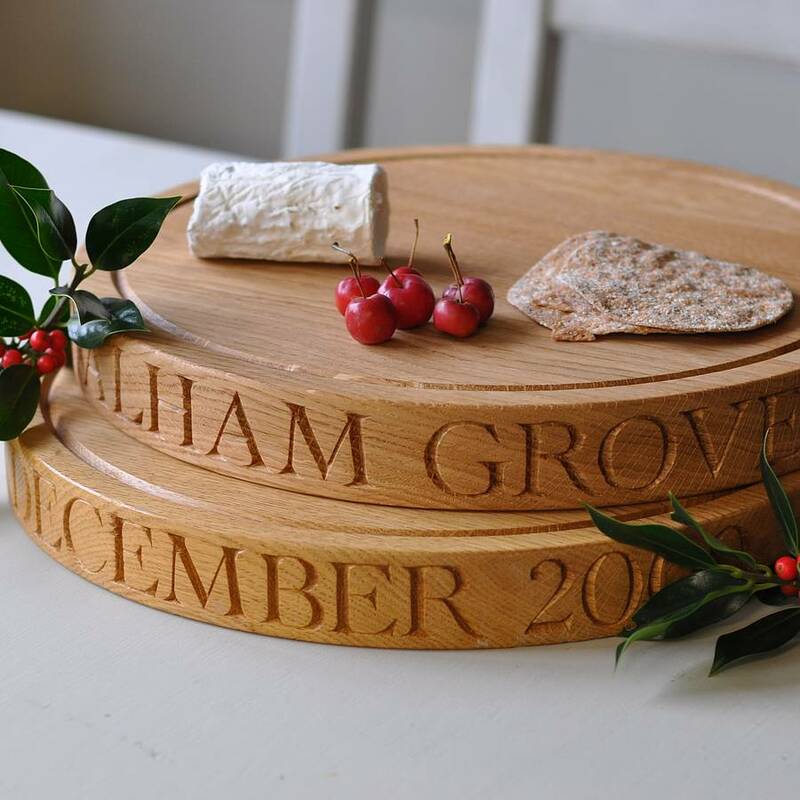 A stunning solid oak cheese board or chopping board beautifully hand carved in our workshop in Kent. We believe this is THE gift 'full stop'. It is practical, personal, original, long lasting, contemporary yet timeless, and hits the spot every time. It is the perfect wedding/anniversary present. 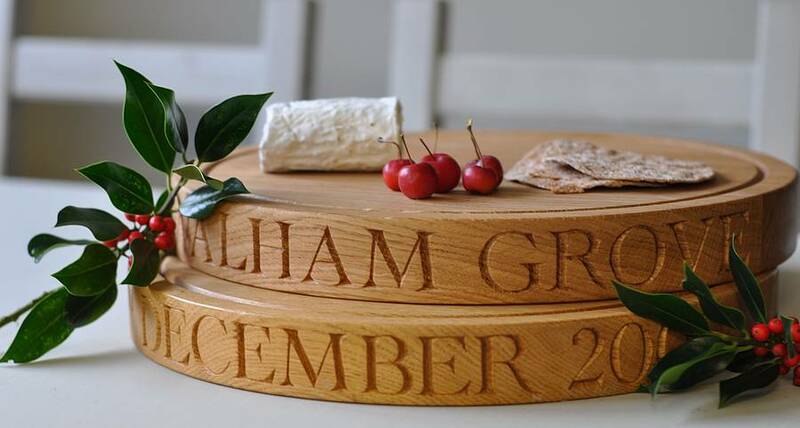 Newly weds will delight in receiving this board with their names and the date of their wedding hand carved around the board, similarly they are perfect for anniversaries. 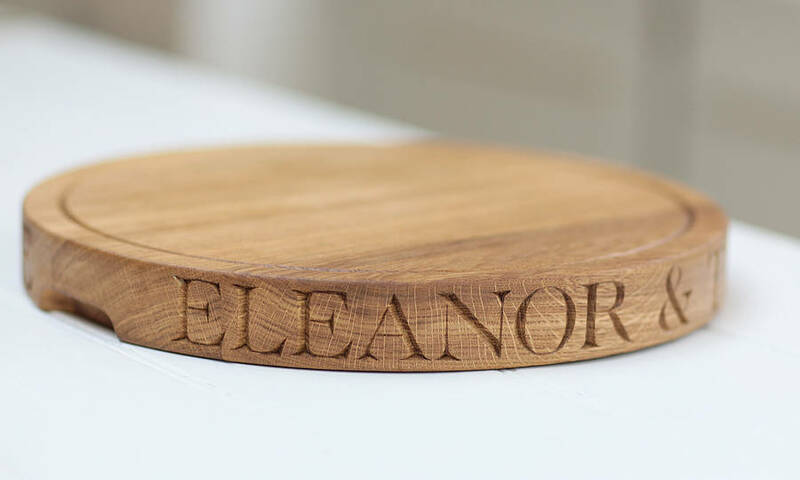 Beautifully crafted in solid oak, this little gem of a cutting board will develop its unique character over time and be a talking point at your table for years to come. An instant heirloom that adds a touch of style, warmth and wit wherever they go. Whether a real foodie or just looking for that little special present for a celebration, this is a sure success. 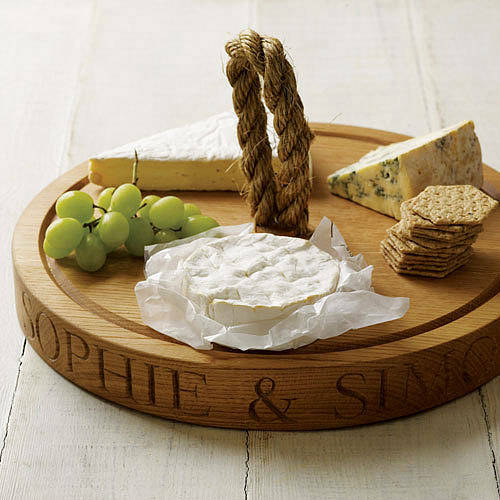 The board is available with a rope handle or two small grooves on the sides that make it easy to pick up from the table, this option gives room for up to 36 characters and spaces all the way round the board. With the groove handles we can fit up to 16 characters/spaces on each side of the grooves, so 2 x 16. 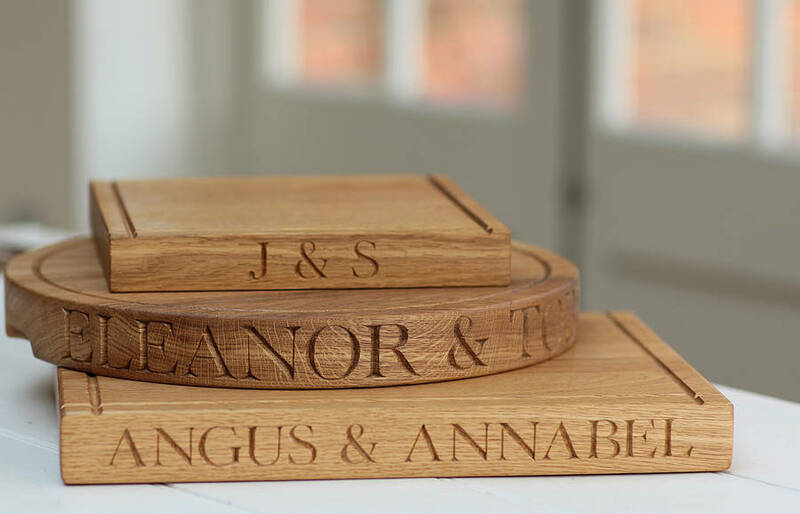 With the wording of your choice engraved, these make great talking points. A fabulous gift for any hard to buy for relative or friend, for weddings, birthdays or any special occasion. Comes beautifully boxed with a complimentary bottle of food safe oil and instructions for how to love & protect these unique and treasured boards for years to come. Regular conditioning keeps your board looking beautiful and easy to clean. You can also buy this food safe oil from large DIY stores, or add a 500 ml bottle to your order here. You can make life easy by adding our gift wrap service to your order. The price includes engraving, all engraving is in capitals. 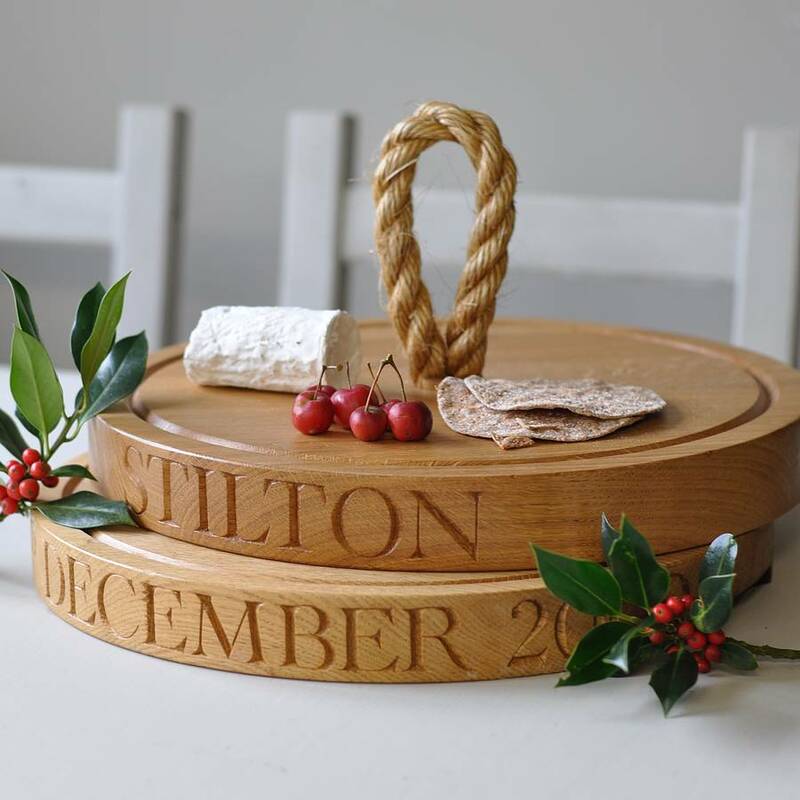 Hand Carved letters in Solid Oak. Treated with 3 coats of food safe oil before leaving our workshop, ready for you to use. 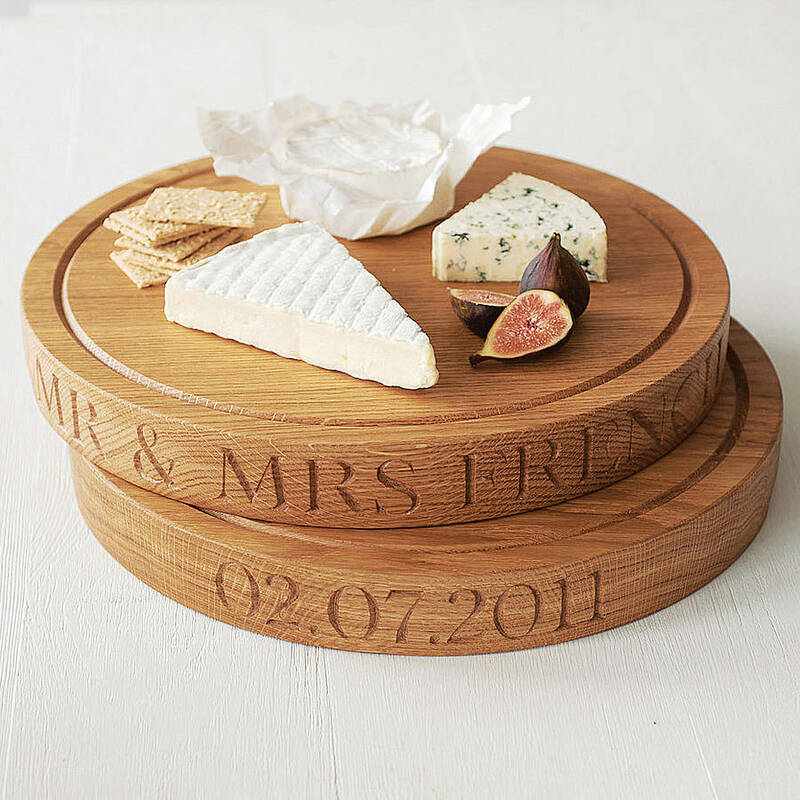 Oak's great strength and durability makes it perfect for use as chopping and carving boards. 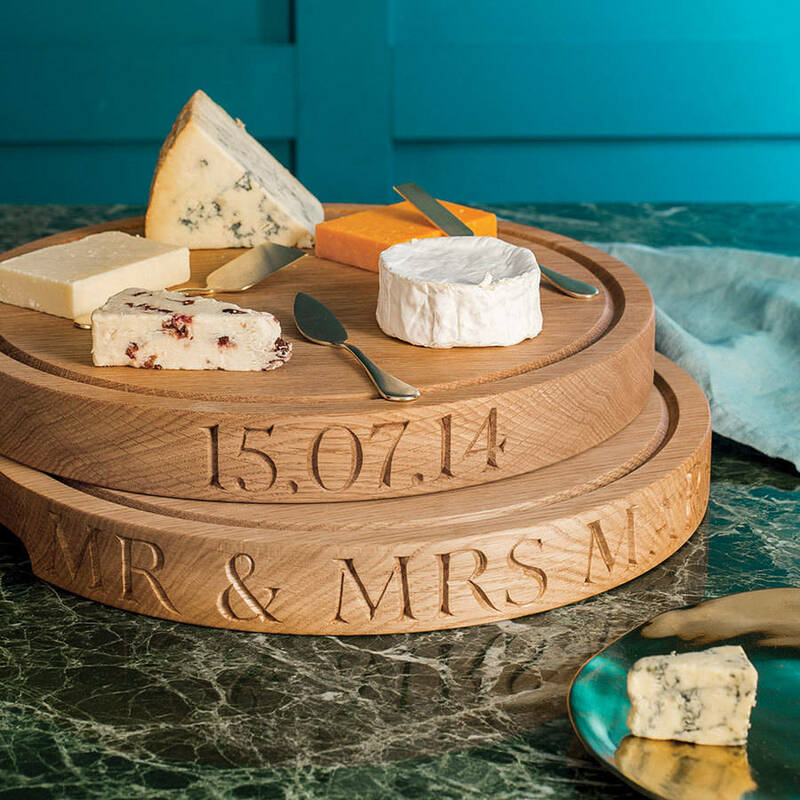 The natural beauty of the wood also ensures that they find centre stage as cheeseboards, serving plates, bread boards and even wedding cake stands. You won’t find this multi-functionality with a synthetic, marble, slate or glass board. They have the advantage of not damaging knives. In addition wood is also somewhat self-healing in that shallow cuts close up and they look even more beautiful over time.